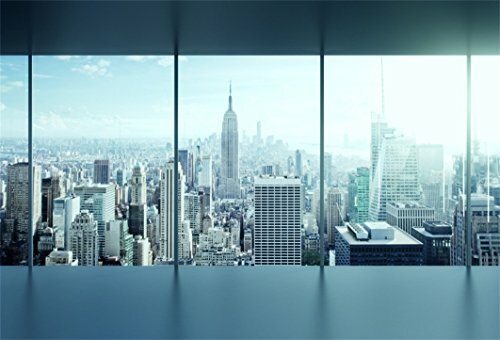 AOFOTO 10x7ft Business Office Sash Window Backdrop French Window Photography Background Casement Work Modern City Building New York Skyscraper Photo Studio Props Success Job Woman Man Vinyl Wallpaper by AOFOTO at FloType. MPN: Q4-3x22NBK07518. Hurry! Limited time offer. Offer valid only while supplies last. Size: 10 x 7 ft. ( 118 x 84 in. ), the width is 3 meters which is 10ft, the height is 2.2 meters which is 7ft. And Also Customized as your request. Size: 10 x 7 ft. ( 118 x 84 in. ), the width is 3 meters which is 10ft, the height is 2.2 meters which is 7ft. And Also Customized as your request. This digitally-created backdrop is an excellent portrait background for people of all ages. It is also well suited for showcasing store displays and for interior decoration, as well as photographing still life arrangements and products. This backdrop is ideal for a variety of events, such as baby showers, weddings, school proms, parties, bridal showers, and holiday celebrations. It also serves as a great background for live performances, such as plays, talent shows, concerts, church pageants, and festivals. It is perfect for television and video productions. All our backdrops are constructed of thin, lightweight vinyl. This material allows for easy folding and portability. Backdrops roll out flat and may be hung either vertically or horizontally. Customized backgrounds can also be created upon request; for additional information, please contact us by email. We Also Supply The Backgrounds With Same Picture In Other Sizes: 6x4ft, 5x5ft, 7x5ft, 8x8ft, 8x6ft, 7x7ft, etc. 1. You can tell the size that you need by email, then we can print the right size for you. Merchandise ships directly from the manufacturer and usually takes 10-18 days to arrive. All backdrops will be shipped folded (due to post office policies on shipping size). If your backdrop arrives with a slight crease, simply iron the back side (not the image side) to easily remove the wrinkle. When doing a photo shoot, it is important to remember that different lighting will produce different results, so one good way to improve your photos is to experiment with adjusting the lighting. With a size of 10 x 7 ft. ( 118 x 84 in. ), this backdrop is ideal for shooting both objects and portraits. It is also perfect for a variety of events, such as baby showers, weddings, home gatherings, parties, bridal showers, school proms, club performances, festivals, stage backdrops, church Christmas plays, and all kinds of holiday celebrations. It makes excellent portraits for people of all ages, ranging from infants and children to teenagers and adults. Additionally, the background is well suited for food and other still life arrangements, showcasing store displays, interior decoration, and product photography. Each backdrop image is high resolution, using high-tech digital designs that make the image more detailed and vibrant, resulting in photos that are more dynamic and realistic. The image is glare free and resistant to fading, though it should be kept out of direct sunlight. Merchandise ships directly from the manufacturer and usually takes 10-18 days to arrive. All backdrops will be shipped folded (due to post office policies on shipping size). If your backdrop arrives with a slight crease, simply iron the back side (not the image side) to easily remove the wrinkle. To avoid possible steam damage, place a layer of dry cloth between the backdrop and the iron. When doing a photo shoot, it is important to remember that different lighting will produce different results, so one good way to improve your photos is to experiment with adjusting the lighting. At AOFOTO, we continually strive to provide our customers with excellent service and quality products. Your satisfaction is important to us. We welcome your feedback so that we may continue to meet your needs and offer you the highest level of customer care. If you have any questions about this product by AOFOTO, contact us by completing and submitting the form below. If you are looking for a specif part number, please include it with your message. Bestshoot M14 Uni-Directional Shotgun, Interview Camera Microphone, Condenser Mic with Furry Windscreen Muff Cover for DSLR SLR Canon Nikon Sony Panasonic Camcorder Smartphone Conference PC.